I have a great affinity with the stone Cross which stands outside my bed and breakfast. After all, I ended up naming my business after it. It’s the 1870s and the horse and cart is the transportation of the day. Back then, Way-Wardens were elected to supervise the highways of a parish or district. The local Way-Wardens believed that the Croscombe Cross was an ‘incumbrance’ as there was only room for a single horse and wagon to pass between the Cross and the mill pond and buildings opposite. In their infinite wisdom they took it upon themselves to remove it. Now the Way-Wardens weren’t subtle. They went at the Cross with crowbars and hammers. The shaft was apparently thrown to the ground and the finial (the ornament on top) broken. 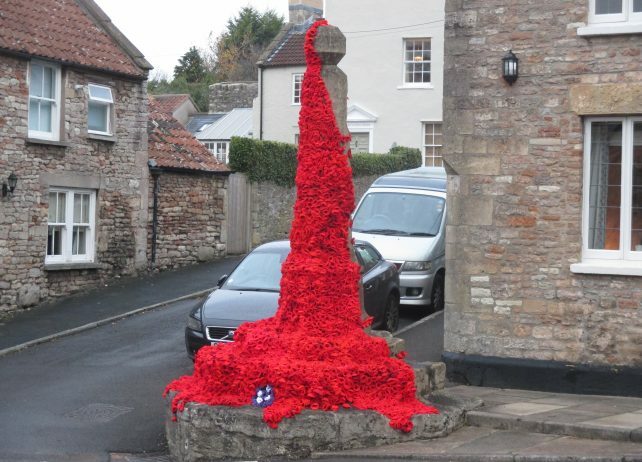 As you can imagine, the inhabitants of Croscombe didn’t take kindly to this act of vandalism. The Cross was an ancient landmark held dear by local residents. A determined bunch, (mainly women by all accounts) drove off the demolishing party and hoisted up a flag bearing the legend, ‘Be Faithful’. Several women stayed to guard the Cross, while others went off to the quarry to find their husbands and tell them the shocking news. That night, around 30 stout fellows volunteered to guard the site. The women prepared beds of straw, brought kindling for a large fire and prepared refreshments. Some later sources infer that the Way-Wardens were driven off by women folk brandishing blazing torches and that the names of these women were written down and placed in a bottle. This bottle was then sealed and embedded under a stone block that was used when the Croscombe Cross was subsequently repaired. Apparently, no further attempt was made to remove the village Cross – that’s people power for you. I’m delighted that a Cross still stands here and hope that we are both around for many years to come!